OK, after taking the boat for a second tripto the lake, it has been deduced that the boat is too heavy to easily get it off the trailer, and the boat is too top heavy and rocks alarmily when I am up in the pilot house. Removed the railings, and started to cut up the second deck. I believe we probably removed 10000 lbs. We will replace the 1 1/2" upper deck with 1/2" plywood ceiling. 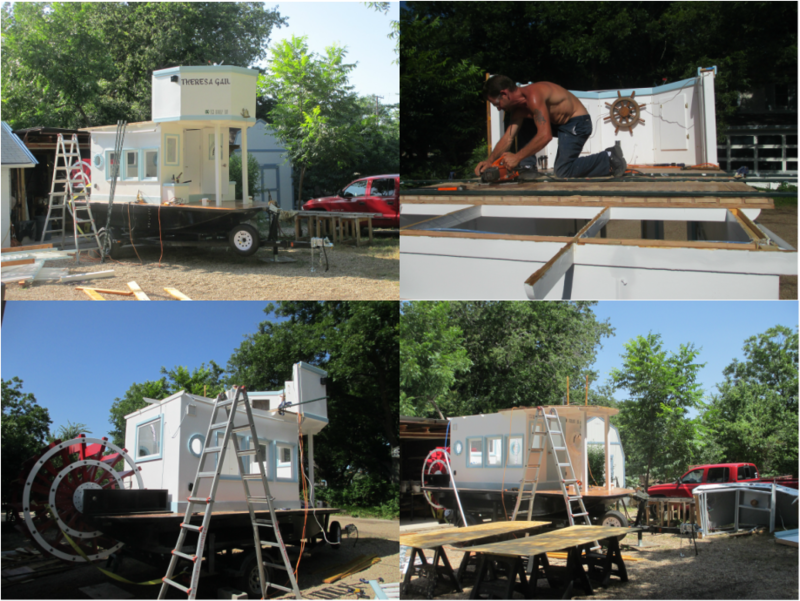 The pilot house will be rebuilt foward of te cabin. Finished removing the upper deck and started plotting the pilot house shape and size. 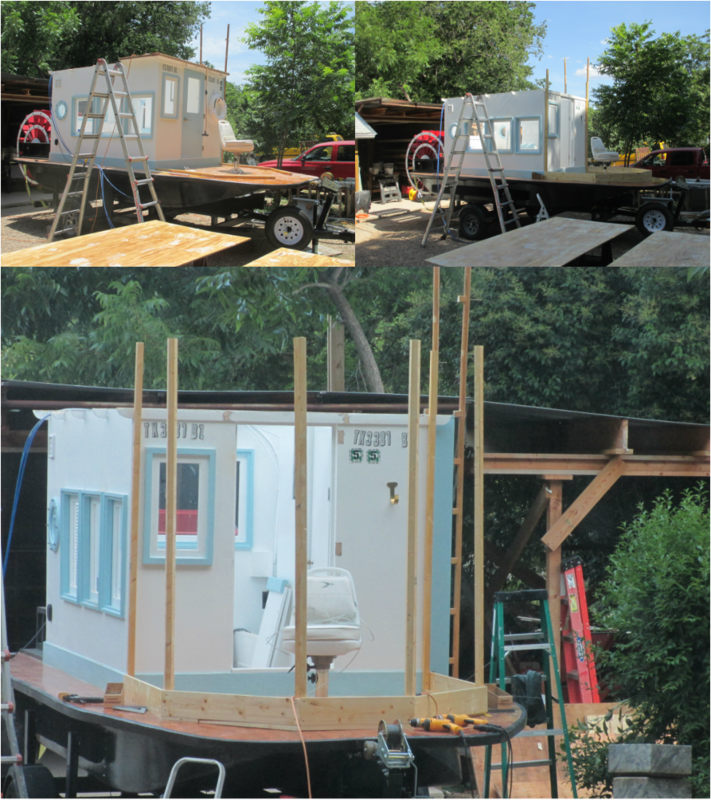 Removed the door, since the pilot house will be enclosed. There will be a new door on each side of the pilot house. I started with determining the seat location and then where the steering wheel would be. New cabin roof is installed, now just need to seal it. Installing roof on pilot house, will not be long before can install windows. Can't use the painted name of old pilot house, so will have to repaint it on new one. boat. Had to strip the wood deck on the red trailer and reweld the metal braces. on opening area above cabin door, so that I will no longer bang my head. 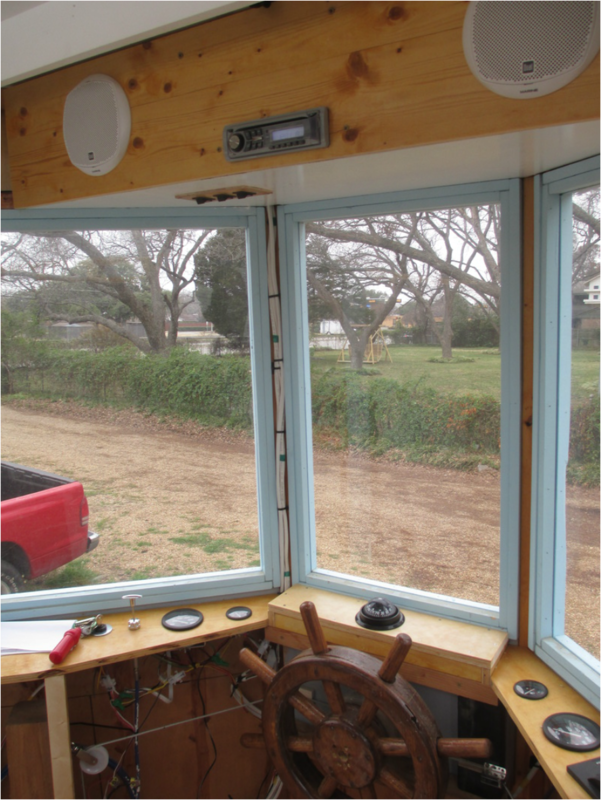 Got first coat of paint on new pilot house, and boy does it make a big difference. Still have to do the wiring and running the steering cables before installing inner panels. Alrighty then. Have taken a large break, since Christmas was on the way. I had to make a few Christmas presents and complete other prjects. Bottled a few more bottles of wine and took a few trips, but we are back onto the boat. I was waiting for the new clutch that went with the torque converter I had orded and bought, but I finally got a message that they could not get me one( took them 3 mounts to tell me this.) Well went on line and found a set and have already got them. I could not find a chain driven torque converter, so having to go for a belt drive system. Attempted to install clutch, but a belt driven one is larger and required me to move the engine back from the hull a bit. and then this made it not line up with the torque converter on the dirrection shif unit. So now we are rotating the engine and having the belt drive be facing the center of the boat. Redesigning motor mount and rotating the shifting unit as well. Here is the torque converter installed on the directional control gear box. Hopefully this will reduce the strain that the other conviguation produced. Without the torque converter, directly hooking the box via chain to the clutch on the motor, this box was ripped off the back bulkhead twice and I had to replaced the clutch as many times. 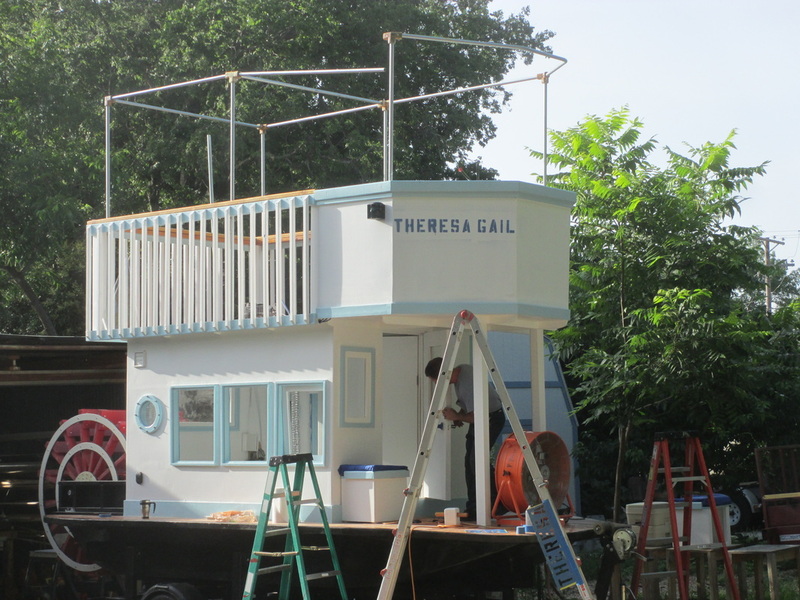 Watched Treehouse Masters and got the idea for these stylish handrails for the top of the boat. I like them so well, plan to replace ladder rails with them as well. All I did was drill two large holes and then cut out the space between them. Turned engine around to handle belt drive. Just waiting for belt to be delivered before mounting engine and routing exhaust. Got engine wired back up and was finally able to start it! Yea! Got rudder cables rerouted and hooked back up. Needed to complete this step before could proceed to dashboard and electrical. Appears my chickens even wanted to help. Been hanging around boat so much, they came over to see waht was up. Busy wiring in gauges and control cables. Using wire bundles and connectors this time, and it sure making it a lot neater. Everything in pilot house all wired up and working. Able to start engine. Even got a radio installed. Alrighty then! Learned some lessons. Best to wait for boat to freely float a little off trailer before attempting to back boat off. Over strained the back bulkhead again by trying to get boat to leave trailer on its own. My wife says she felt the truck being pulled back and had to press as hard on the breaks everytime I would gun the engine. I am always worried bout stalling the vehicle and having to be rescued. So i have bought an extension tongue for the trailer (I just bought it so will use for the up coming attempt to launch.) You can see it sitting on the boat side. Added 2"x 12"s along the read bulkhead and bolted the gear box completely through them. Added both belt and chain tension rollers. You can see a new smoke stack, which is held on with tension wires. As a side note: Although I felt the attempt was a failure and afraid I had ruined the expected good time of my friends and family who came down to support us, God helped out on the entertainment department. He sent a pair of geese to sneak up on me while I was in the water attempting to get the boat back on the trailer, and had the start pecking my rear. I had to decide to salvage my dignity or boat, and the boat won. So I had to endure the geese chasing me around amid the cheers and laughter of all. I wish they had videoed it, but all they got was maybe one picture. Added smoke stack with wire tiedowns. The stress of the boat trying to drag itself off the trailer before the hull even begins to float, caused the back bulkhead to crack. To remedy this I strengthened the wall with 2"x12"s and also bolted the gear box completely through them. The wooden device above the gear box is a make shift break system to make changing gears easier. It only required a little pressure to stop the belt once the clutch has disengaged. Oh just remembered. I had also broke the plastic gear shifter for the second time. While attempting to buy another, low and behold, they now make them in aluminum. Here is the strengthened rear bulkhead. But upon further thinking, I believe if I had originally allowed the boat to freely float first, then maybe the repeative cracking of walls, or pulling off said wall of the gear box would never had happened. Here is the chain tension rollers installed. And finally the promised geese picture. I was trying to dicourage them from pecking at me, not sure if it was me or the big fish picture I had on the back of my shirt.